The North Sea, long considered harsh and unforgiving, will soon play host to one of the world’s greatest Atlantean dining experiences. 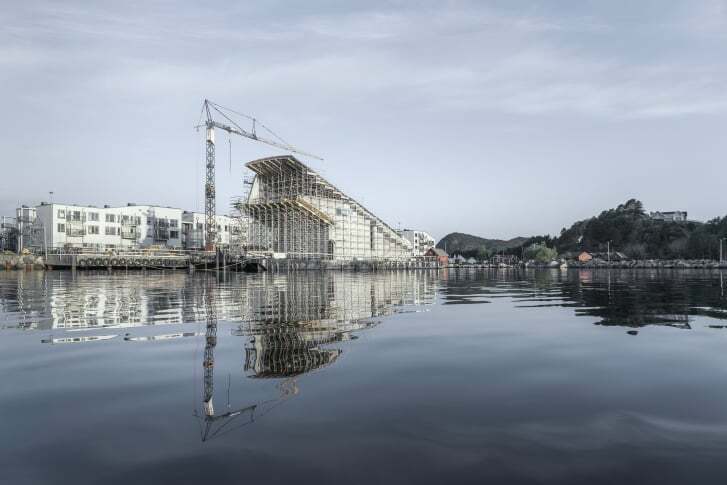 Five meters below the surface of the sea, in a town called Båly along the south-most tip of Norway, the world’s largest underwater restaurant is almost fully constructed and ready for operation. Under offers a unique view of the surrounding marine life through a 36ft-wide panoramic window. According to a report by CNN, the 110-foot long structure, which looks like a sunken periscope, was submerged in July this year after most of the construction components were completed, work is now underway on the interiors and the restaurant is anticipated to be open to the public by April 2019. Simply named “Under”, the restaurant is designed of Norwegian outfit Snøhetta, a company that has made a name for itself with projects such as the Bibliotheca Alexandrina in Egypt, the Oslo Opera House, the National September 11 Memorial Pavilion and the renovation of Times Square in New York. When completed, the restaurant will be able to accommodate more that 100 guests at a time within its 5,300sq ft floor area, which will be spread over three levels. 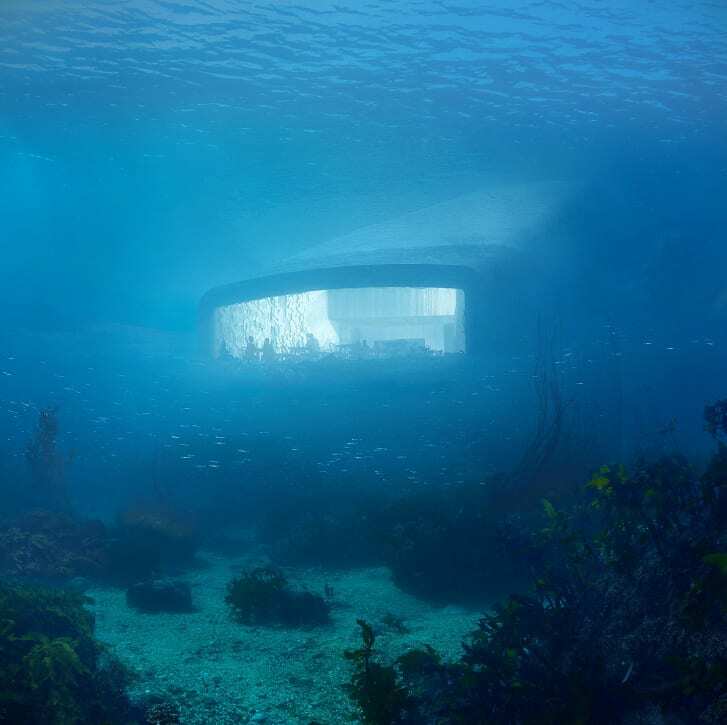 Each level offers unique undersea views of the surrounding marine environment through a 36ft-wide panoramic window. Most of the construction work on the restaurant was done a barge near off the coast of the town, before being towed into position with a heavy-lift vessel. Interestingly, in order to submerge the structure, containers filled with water were placed inside the building and it was subsequently secured to the sea floor with 18 anchor points. 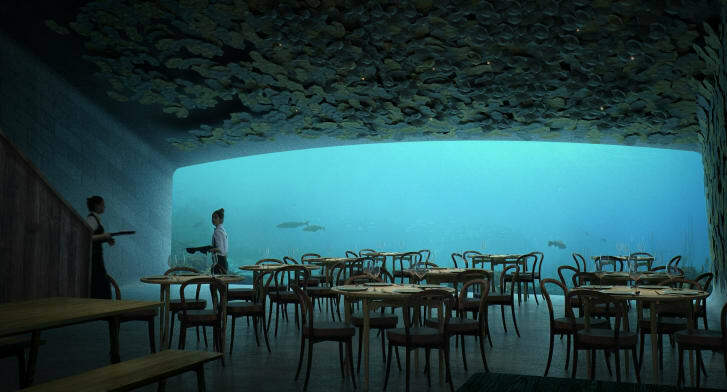 More than half the entire structure is permanently submerged and guest will gain access to the restaurant via a glass walkway that bridges the gap between the coast and the entrance. When completed, the restaurant will be able to accommodate more than 100 guests at a time. The Norwegian coastline is well-known for its rough and choppy waters as well as strong winds, and as such, Under is made of reinforced concrete. The building is also slightly curved, so it can better withstand the rough waves, while the concrete walls are 1.6ft thick and the glass windows are 1ft thick. The decision to position the restaurant in an area battered by the elements was deliberate, say its designers at Snøhetta. This was done so it would better capture the nature of the area and make the entire experience more spectacular. The structure is made with reinforced concrete in order to withstand the rough and windy North Sea. 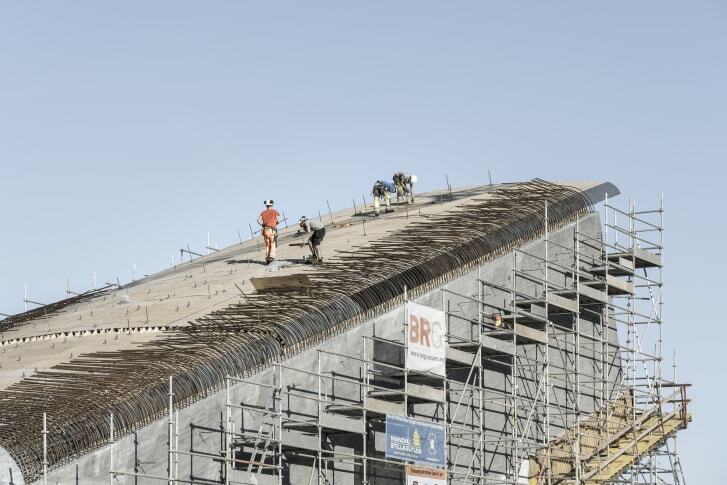 To guarantee the safety of guests, an analysis was conducted to study the propagation and load of the waves, and the 2,500-tonne structure is designed to withstand the most extreme events. The data will also be fed back to visiting research teams that study marine biology and fish behavior. Work has been done to restore the conditions that were in place prior to the disturbance created by the submerged structure, and the concrete shell is designed to invite mussels to cling onto it and blend into the surrounding nature. From the main window in the dining area, which is 13ft tall, guests will be able to observe a variety of fish and sea creatures including seals and lobsters. Crucial to providing this view is the lighting, which has been carefully designed for both the interior and the sandbank just outside. And what about the menu? No surprise, the specialty will be seafood, but the menu will be created by Danish head chef Nicolai Ellitsgaard Pedersen using a combination of ingredients from the sea and the surrounding landscape. A truly local experience.